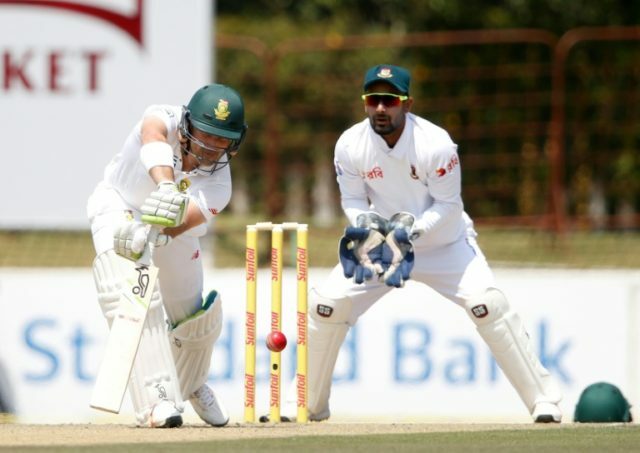 Potchefstroom (South Africa) (AFP) – Opener Dean Elgar batted through the opening day for an unbeaten century as South Africa piled on the runs against Bangladesh at Senwes Park on Thursday. His only specialist spinner, Mehidy Hasan, was brought in as early as the sixth over. Bangladesh batsman Sabbir Rahman effectively admitted that his team may have made the wrong call. “Normally in South Africa there is grass and bounce on the pitch, so were surprised that it was more like a Bangladesh wicket,” he said. Markram, 22, who captained South Africa to the 2014 Under-19 World Cup title, was Elgar’s fourth opening partner of the year and together they posted South Africa’s first half-century start in 16 innings before converting it into three figures shortly after lunch, the first century opening stand since December. Their partnership was the highest first-wicket stand for South Africa since Graeme Smith and current batting coach Neil McKenzie put on 204 against England at Lord’s in 2008. Elgar, on 99, played a ball from Hasan towards backward point. Elgar took a couple of steps outside his crease and Markram set off for a run. But he was sent back and stranded well short of his ground as Mominul Haque’s throw reached Hasan. Markram, who said he was “more than happy with the 97”, added the most important thing was that the team was in a good position.